The PXI-XJLink2 module allows the integration of XJTAG into PXI-based test systems. PXI-XJLink2 has one JTAG controller that can be connected to up to 4 JTAG chains, which are configurable for pinout and voltage. It is easily integrated with LabVIEWTM with a full set of Virtual Instruments (VIs) included. 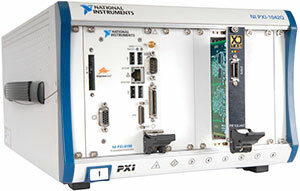 Standard PXI interface: ideal for lab and production work. Easy integration with NI’s LabVIEW™ and TestStand™*. PXI-XJLink2 provides a JTAG solution that can be integrated with other test equipment using the industrial PXI standard designed to minimise the effect of electrical noise. CompactPCI® compatible so it can be used in any cPCI or PXI-based test system. The standard .NET and COM interfaces allow you to integrate XJTAG testing with test executives such as NI LabVIEW™, LabWindows™/CVI, with ATE machines, or a bespoke application written in languages such as Visual Basic .NET® or C#®. XJTAG provides coding examples for LabVIEW, LabWindows, C#, C++ and Visual Basic. From a single port system for development to multiport test and programming systems in production, the PXI-XJLink2 module provides a flexible, scalable JTAG solution. PXI-XJLink2 has variable signal termination, so it can handle boards both with and without signal termination. The advanced auto-skew control enables you to get the maximum frequency out of your JTAG chain and cable.